This summer has flown by and as many families wrap up summer vacations and camps, thoughts turn to back-to-school preparations. The transition to a new school year, and often new school buildings, and new peers and school staff can raise anxieties in any child or teen. For kids with special needs in our adoptive, foster and kinship families, however, the re-entry can be extra challenging. Take an evening breather and join Formed Families Forward for a free webinar Back to School:Surviving Re-entry on August 22 at 6:30 PM. Join in from whereever you are enjoying your last blast of summer- the pool, the beach, your living room! We will share strategies for easing the emotional and academic demands and suggest tips for improving communications with school staff. Participants are invited to share their "go-to" hints and helps. We hope you join us. As you prepare to fill the closets of your teens and young adults (and maybe your own...) with fall fashions, consider shoping Mission Mondays at the Fair Oaks mall Altar'd State store. Formed Families Forward is the grateful recipient of 10% of store sale proceeds during Mission Mondays, every Monday through fall. What a great reason to look fabulous while supporting adoptive, foster and kinship families! Thank you. As you may be aware, President Trump's administration ordered a review of many current regulations, including those that guide delivery of services and supports under the Individuals with Disabilities Education Act (IDEA). The U.S. Department of Education is seeking input on regulations that may be appropriate for repeal, replacement, or modification. Comments are due August 21. 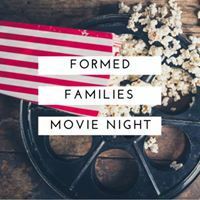 Register now for Formed Families Forward's fall family movie night on Friday, September 15 in Fairfax. Following a light meal of pizza and salad, children enjoy a G-rated movie while next door, parents and caregivers screen Moment to Moment: Teens Growing Up with FASDs.The hour-long film explores the lives of four adolescents with fetal alcohol spectrum disorders. Therapist and FASD expert David Perry, LCSW, will join us for reflection and discussion following the film. Reserve your seats now! Q: I have two foster sons who have IEPs and I keep hearing the school talk about "plops". What is that? A: Great question. There are so many acronyms that parents, caregivers or students should always ask if they don't understand a term being used. "PLOP" stands for present level of performance. Review and written description of a student's present of performance is a required component of the individualized education program, or IEP. 1. A statement of the child’s present levels of academic achievement and functional performance, including how the child’s disability affects the child’s involvement and progress in the general curriculum or, for preschool children, as appropriate, how the disability affects the child’s participation in appropriate activities. a. The statement shall be written in objective measurable terms, to the extent possible. Test scores, if appropriate, shall be self-explanatory or an explanation shall be included. The PLOP section of the IEP is an opportunity for the team to examine current school performance and how that performance impacts participation in the general curriculum. You might think of this statement as describing the status quo, where your child is now and from where decisions about goals for the coming year will be considered. The IEP team can use SOL testing and other assessment results, progress reports, work samples, classroom behavior data, and other documentation. Families can also use the PLOP to share outside assessment results, other measures or even narratives from non-school providers, such as therapists. This may be a good time to share your observations and concerns about social, emotional, behavioral or medical impacts on academic and overall school performance, especially any data you have collected. For example, over the last month, Johnny completed assigned math homework 3 of 15 times independently. On six of the 15 assignments, he verbally refused and destroyed worksheets. Consider preparing a draft of your contributions in advance and bringing printed and electronic copies for ease of sharing with the team. As the IEP team works to write annual academic and functional goals, parents and caregivers and participating students should ask questions about how the information in the PLOP is being used to identify evidence-based interventions and establish appropriate annual goals. Back to School for Everyone! August 17 - So What's Wrong with Kids These Days? An Exploration of What We Can Do to Support Children in a Complicated World, sponsored by SCAN of Northern Va, Ashburn. August 31- Resources for Supporting LGBTQ Students and their Families, hosted by Fairfax County Public Schools Parent Resource Center, Dunn Loring. October 28 - ADHD and Screen Time: Turning Problems into Solutions, hosted by ADHD Resource Group of No Va and CHADD, Alexandria. Ticket fee. Anytime- Formed Families Forward webinars , archived and available on demand. Fairfax Kinship Families: Getting to Know You! Fairfax County Department of Family Services is establishing a Kinship Family Institute (KFI), which will provide needed services for kinship families — those in which children live with relatives or close family friends. They are interested in learning what services or supports kinship families currently use as well as what additional services or supports are needed. Fairfax County kinship caregivers are asked to complete a brief 10-minute survey. If you would rather complete the survey by phone, please call 703-246-4546. Don't miss your weekly pick-me-up story this summer, posted on Facebook. We are inspired by these recent stories of children and youth with special needs and those in formed families making strides to improve themselves, families and communities. LIKE Formed Families Forward on Facebook and get the latest stories, news, position postings, event updates and information just for foster, adoptive and kinship families! Formed Families Forward is a non-profit organization dedicated to supporting adoptive, foster and kinship families. Check out our new introductory video and learn more about who we are and the families we support.